CONTENT LONDON: US streamer Hulu led the way with three prizes at C21Media’s International Drama Awards, two of which went to its hit drama The Handmaid’s Tale. The adaptation, produced by MGM Television for Hulu, has been one of the most talked about series of 2017 and aired in the UK on Channel 4. It won the Best English-Language Drama Series and its star, Elisabeth Moss, took the Best Female Performance gong at the awards ceremony this evening (Wednesday), which marked the culmination of C21’s annual Content London event. Hulu also picked up the Editor’s Choice award from C21’s editor-in-chief and managing director David Jenkinson. This followed an outstanding year that has seen it become the first streaming service to pick up a Best Drama Emmy, commission originals such as The Path and partner on headline-making dramas such as Electric Dreams with Channel 4 and Hard Sun with the BBC. Rival streamer Netflix took the Best Casting of a Drama Series gong for The Crown (Left Bank Pictures) and Best TV Movie for Black Mirror: San Junipero (Endemol Shine Group). Midnight Sun, a French-Swedish coproduction by Nice Drama and Atlantique Productions for Canal+ and SVT, took the Best Foreign-Language Drama Series. StudioCanal is handling distribution of the show, about a series of killings in a remote Scandinavian mining community. 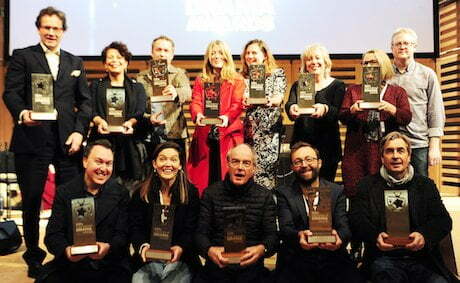 Channel 4’s Catastrophe, produced by Avalon, took the Best Returning Comedy Drama award, while Big Little Lies, for HBO, was named Best Miniseries. CanalPlay’s High Life took Best Original Digital Drama fresh from the news of its acquisition by BBC3, revealed exclusively by C21 earlier this week. High Life is a unique online drama series which tackles difficult subject matter in a heartwarming and entertaining way. It was made independently and has already made sales in the US, France and Australia. On the festival circuit it has won eight awards at three festivals, including two best series and two best director awards. Written by and starring Sharon Horgan and Rob Delaney, the series has garnered universal critical acclaim and a raft of awards since launching in 2015. Viewing of the second series of Catastrophe was up 20% on series one and averaged 1.4 million/7.0% over the six episodes, making it Channel 4’s second highest performing comedy of the year. Nordic Noir meets British murder mystery in this original crime dramedy directed by Simen Alsvik (Lilyhammer). Thrilling and funny, and produced in Swedish and English, Fallet breaks new ground in Nordic Noir as two unlikely detectives team up to solve a gruesome murder. Nominated for best comedy in the Seoul International Drama awards. Starring Lisa Henni and Adam Godley. San Junipero is one of the most beloved Black Mirror films and has become a cultural phenomenon. A love story set in 1980s California, it is steeped in nostalgia but still unfolds a mind-bending concept, as is Black Mirror’s trademark. Through two stunning central performances, the film transports us across different eras and marks the show’s first happy ending. Based on Liane Moriarty’s bestselling book, this subversive, darkly comedic drama tells the tale of three mothers of first-graders whose seemingly perfect lives unravel to the point of murder. Starring Reese Witherspoon, Nicole Kidman, Shailene Woodley, Alexander Skarsgard, Laura Dern, Adam Scott, Zoe Kravitz, James Tupper and Jeffrey Nordling, directed by Jean-Marc Vallée from scripts by David E Kelley. Broadchurch’s third and final chapter built on and added to the previous seasons’ domestic and worldwide success and helped define ITV as a home for quality drama. The extensively researched crime drama tackled the difficult and important subject of sexual assault. Boosted by authentic performances and a beautifully cinematic landscape, Chris Chibnall’s distinct poetic vision captivates, thrills and entertains. The ambition of Left Bank’s The Crown is unparalleled; the world these characters inhabit is incredibly exquisite, pushing the creative teams to give the series the scale it needed. But at the heart of Peter Morgan’s drama is how a family copes with extraordinary circumstances. Receiving rave reviews in the UK and worldwide, The Crown also won two Golden Globes. Tom Hardy’s nuanced and visceral performance as James Delaney in Taboo redefined expectations for a lead period drama role. Part servant, part psychopath, Delaney is both ruthless and ravaged by his own previous wrongdoings. Torn between revenge and love, Hardy skilfully walks the line between violent unknowability and vulnerability. Rarely is the most chillingly topical drama of the year also the most exquisitely crafted and distinctive. Elisabeth Moss’s stand-out performance and defiant monologues shine through as commentary on our current reality as much as that of the dystopian world. The Handmaid’s Tale resonates loudly now and will no doubt be the definitive portrayal of repression for years to come. French crime meets Nordic Noir in this jaw-dropping series. A French Algerian policewoman teams up with a Swedish prosecutor with Sami heritage to solve a murder in the land of the midnight sun. Nominated for awards in the categories best drama, best script and best actor/actress at L’Association des Critiques de Séries, Monte Carlo TV Awards and BANFF Rockie Awards.